RelateHost Review 2019: Is RelateHost a Good Hosting? Whether you want SSD shared hosting with beginner-friendly features or a managed dedicated server with 99.99% network uptime, Texan IT company RelateHost is a great option. This U.S.-based company with two data centers provides a modern and relevant hosting service with excellent support. RelateHost is a relatively new hosting provider that first launched in 2013. To the team’s credit, the company has quickly grown to become a polished operation with relevant hosting products, features, and services. RelateHost is an American hosting provider based in Laredo, Texas, with two data centers in Chicago and Austin. You’ll find that RelateHost’s plans provide adequate resources for most businesses. I also appreciated that the company clearly outlines the finite resources included with each package, instead of promising “unlimited” resources and then hiding the limits somewhere in the fine print. You’ll also notice that the shared hosting packages are rich with features. All packages support multiple domains with two out of three making it possible to host an unlimited number of websites. You’ll get a combination of LiteSpeed Web Server and CloudLinux OS, which are optimal if you’re planning to host a WordPress website. SiteLock is also a great security and performance suite with a firewall, CDN, and other website essentials. RelateHost provides a relatively straightforward but feature-rich range of shared web and dedicated server hosting products. It isn’t the cheapest host out there, but it’s not meant to be. Looking at the features, you’ll realize that the company backs up its prices with more value than most other hosts. Some of the features that contribute to the higher prices are SSD storage, SiteLock (free from the Professional plan onwards), free domain registration, and the included website builder. You also get free DNS management, email forwarding, and ID protection, all of which are usually paid extras. The dedicated servers are a bit expensive compared to the competition, but the managed services do somewhat account for it. The only downside I see is that it’s a steep jump from shared to dedicated hosting: there isn’t a mid-range choice available. You can opt for a one, 12, 24, or 36-month billing cycle on all shared hosting plans. These are backed by a 30-day money back guarantee. RelateHost has technical customer support available around the clock via email, ticket, live chat, and phone. What’s impressive is that the team responds swiftly even during the holidays. I messaged them at odd hours just to check on their responsiveness and got quick responses even when it was late at night. Unfortunately, though, their knowledge base is still mostly empty and it seems that they’re still in the process of creating video tutorials. 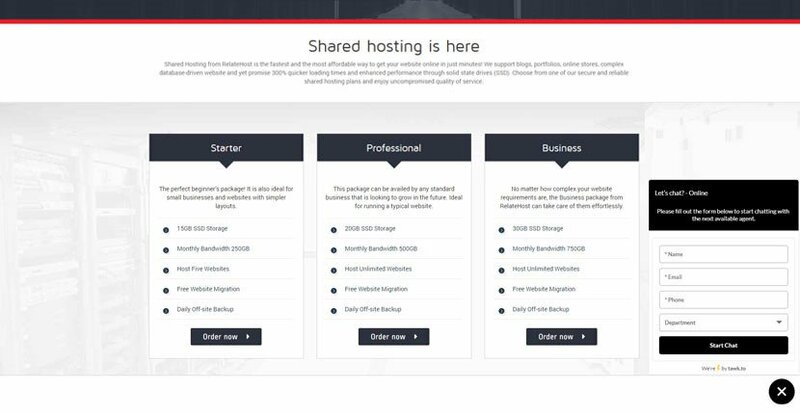 Those looking for shared hosting will find feature-rich packages for great value with RelateHost. However, if you anticipate scaling up to a VPS in future, you may want to look elsewhere for more seamless upgrades. Wondering how RelateHost stacks up against other Web Hosting companies? Enter any other Web Hosting company and we will give you a side-by-side comparison.